If you could get crisp fresh, healthy vegetables on the table at a fraction of the cost, would you do it? What if the solution also gave you a fun-filled family activity along the way? And what if it was likely to get your kids to eat their greens? It doesn't matter if you do a huge grocery shop every week or just grab fresh stuff as you go - it is easy to see the cost of fruit and vegetables is on the rise. Economists will tell you this increase is directly related to oil. As the price of fuel goes up so does the cost of transporting fresh produce from the farmer to the retailer and, as always happens, this cost is passed on. At the same time controversy rages about the effects to our health of genetically modified foods, and chemcial fertilisers and the price of organic produce skyrockets. As a parent, it's hard to balance health and budget, decipher truth from fiction and make an informed decisons for your family. 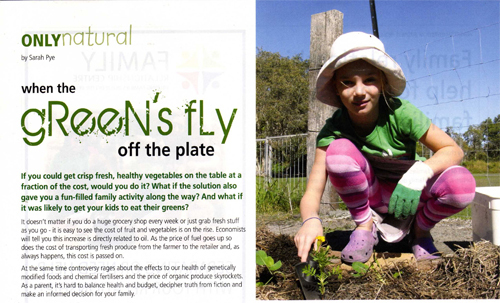 One Sunshine Coast mother, Leonie Shanahan, is convinced that kids who grow their own food have more fun, a healthier diet and save money. Trained in horticulture and an active member of Noosa Permaculture, she decided to put her vegetables where her mouth was and get kids enthused about growing their own. "Children today eat so much lifeless food - full of preservatives, artificial colouring and food never seen in nature," she says. "I wanted to teach kids the life skill of growing food." There are three ethics of permaculture - caring for the earth, caring for people and the philosphy of 'fair share' and reducing unnecessary consumption. 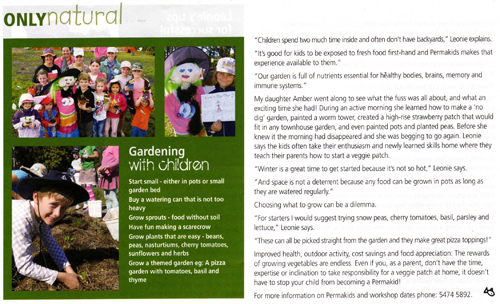 Using these principals Leonie has successfully set up 11 school garden programs since 2004 and recently took over running Permakids workshops at the Peregian Permaculture Gardens. 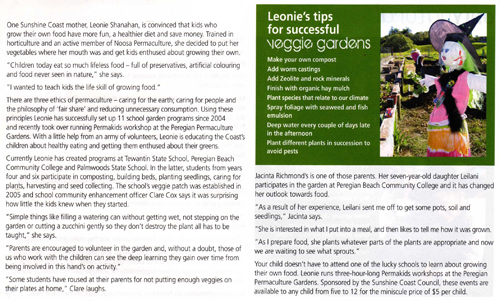 With a little help from an army of volunteers, Leonie is educating the Coast's children about healthy eating and getting them enthused about their greens. Currently Leonie has created programs at Tewantin State School, Peregian Beach Community College and Palmwood State School. In the latter, students from years four and six participate in composting, building beds,planting seedlings, caring for plants, harvesting and seed collecting. The school's veggie patch was established in 2005 and school community enhancement officer Clare Cox says it was surprising how little the kdis knew when they started. "parents are encouraged to volunteer in the garden and, without a doubt, those of us who work with the children can see the deep learning they gain over time from being involved in this hand's on activity. "some students have roused at their parents for not putting enought veggies on their plates at home," Clare laughs. Jacinta Richmond's is one of those parents. Her seven-year-old daughter Leilani participates in the garden at Peregian Beach Community College and it has changed her outlook towards food. "She is interested in what I put in a meal, and then likes to tell me how it was grown". "As I prepare food, she plants whatever parts of the plant are appropriate and now we are waiting to see what sprouts."